Seating both indoors and outdoors, slightly uncomfortable chairs and reasonable coffee. Most urban cafes are very similar and Sip Cafe in Teneriffe seems to fit this description too. Sip Cafe is on Vernon Tce, near the river. It is one of the small cafes at the bottom of the apartment blocks in Teneriffe. 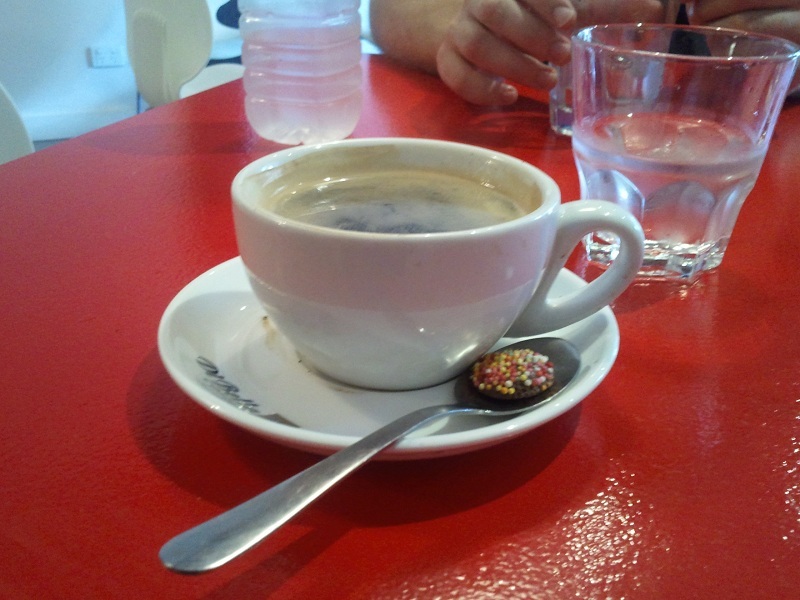 The coffee was OK, exactly what you could expect from Di Bella. It was served with a chocolate freckle, which you need to eat sooner rather than later. As it turns out, chocolate melts when it is too close to hot liquids. Apparently their breakfasts are not too bad, at least according to one of my friends who I was meeting there for coffee, and according to Sip’s Facebook page. This time we did not get a chance to test this for ourselves; as we had all eaten before we met up. There actually isn’t anything wrong with Sip Cafe. The coffee is good, it has a fridge with a glass door and the usual drinks, and if you live in the apartments above it, the location is great. It is just that there is no real compelling reason to go there other than convenience. Fair enough calls.. the only thing you need to add is that the owner, Taree.. is totally awesome.. and works mostly on the weekdays, but contributes massivly to the vibe of teneriffe.. every customer loves her as she is always super-friendly and keen for a chat.. obviously more so when she’s less busy ! this is the reason the cafe is so popular. Also, they’re pretty good about tailoring the food to exactly what you want.. mind you most cafe’s are.. add items to the menu if there’s request, and great with thinks like accounts for local people best place to go imho.